It’s been quite a while since I’ve posted to the blog. Before Christmas I was working two jobs so work life intervened. Then, just when work quieted down a bit, my best friend found out the cancer she had been battling was back, and it was back with a vengeance. We lost Sarah earlier this month, just before her 34th birthday. Everyone – including her – thought there would be more time. Time for a bit more fun, a few more long talks, reminiscences, goodbyes. To say it’s been difficult for everyone who loved her is an understatement. She was an amazing wife, mother, friend and surgeon and her passing leaves a void that can never be filled. I’m sure all the self-help gurus would frown at this, but when life gives me lemons, I like to add some sugar to make it slightly more palatable. 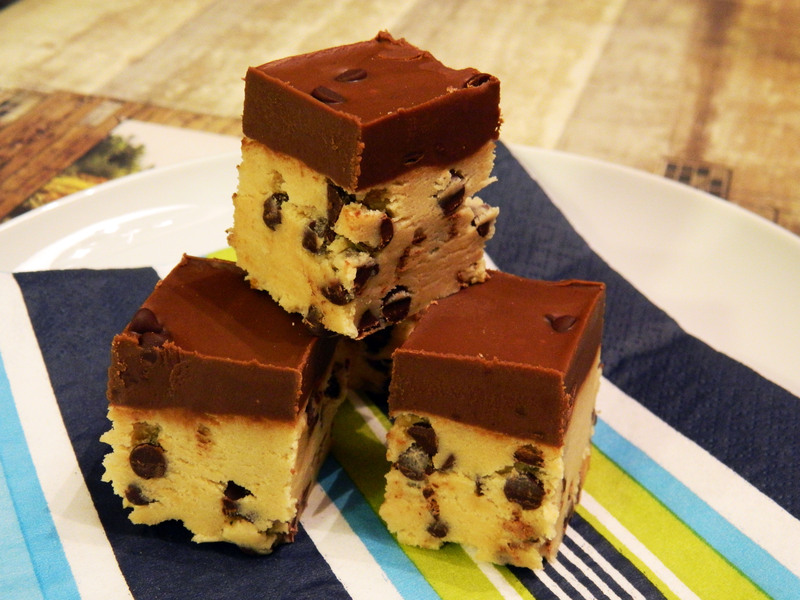 This recipe is pretty much the epitome of comfort – chocolate chip cookie dough in bar form. The best part is that it’s no bake so it requires basically zero effort. Try it out if you’re having a bad day, or even better make it for someone else who’s having a rough go of it. In a stand mixer or large bowl, beat together the butter and brown sugar until light and fluffy. Add the vanilla and beat until combined. With the mixer on low, alternate adding in the flour and sweetened condensed milk and mix until combined. Fold in the mini chocolate chips with a spatula. Line an 8×8-inch pan with tinfoil or parchment. Press the cookie dough into the pan with lightly floured hands. For the topping, combine the peanut butter and milk chocolate chips in a microwave-safe bowl and heat until smooth. Spread the mixture over the cookie dough bars. Sprinkle with the reserved mini chocolate chips. Chill the bars for 1 hour or until topping is firm.